The PFT office has moved! Effective March 2019, we are now located at 1301 Redwood Drive #225, Petaluma, 94954. Petaluma Teachers are committed to providing the best quality education possible for our students while creating equitable and sustainable working conditions for our Federation Members. ​COPE (Committee on Political Education) ​meets regularly at the PFT Office. Our Committee on Political Education (COPE) is looking for representation from each site. Please contact our COPE chair Tiana Grzebik or the PFT office for information. BOARD MEETINGS are held on the second and fourth Tuesdays of each month at the Petaluma City Schools District Office Board Room, 200 Douglas Street, Petaluma, beginning at 6:00 PM for public sessions. It is so important for our members to attend these meetings. Please attend and be informed!! PFT's Gary Ravani Memorial Scholarship is available annually for senior students of active PFT Members, and is awarded by the Petaluma Educational Foundation at their May event. Please see our Contract/Resources page for more information. The digital copy of the application is available HERE. Applications are now closed for 2018-19, but will be available again in January 2020 for next year's graduating seniors. 2019 is a special year for our union – the CFT celebrated its founding 100 years ago. In our centennial year, the CFT Convention was held March 22-24 at the lovely Millennium Biltmore in Los Angeles. PFT 1881 sent our President Sandra Larsen and four voting delegates elected by the members. Todd Siders (Casa), Erinn VanderMeer (KJHS), Kelly Kovanis, and Krista O'Connor (both PHS) attended Committee meetings, reviewed resolutions, and participated in the Floor Debate to help determine, shape, and support educational legislation for the coming two years. The next CFT convention will be held in 2021. 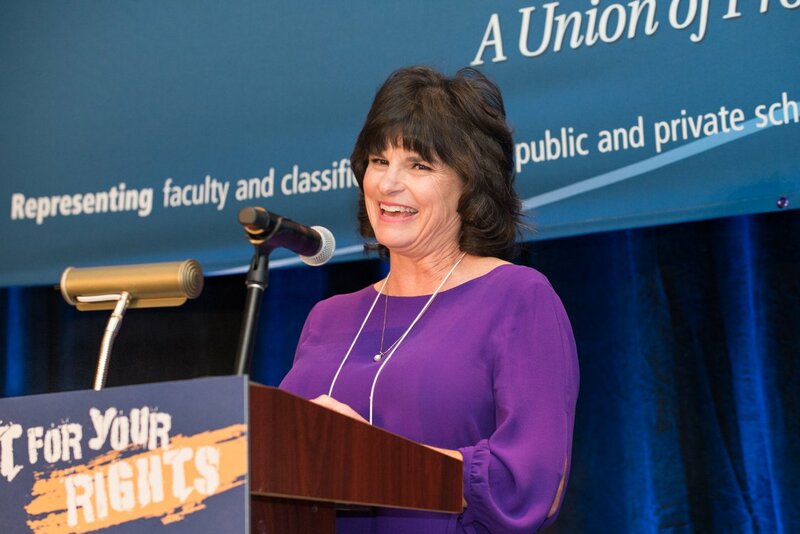 Additionally, last year's recipient of the CFT Women in Education Award is Sandra Larsen, president of the Petaluma Federation of Teachers, who led the local in its first strike last year to win much-needed improvements for district teachers. Congratulations, Sandra! See our new Community Support page where we are adding statements, with permission, from parents and the community in support of teachers and our students. If you would like to be included, email us at pftoffice775@gmail.com.